Chanel cardigan. Mikimoto pearl studs. Chanel necklaces and cuff. DKNY tights. Isaac Mizrahi dress. Chopard ring. Hue tights. Chanel pumps. 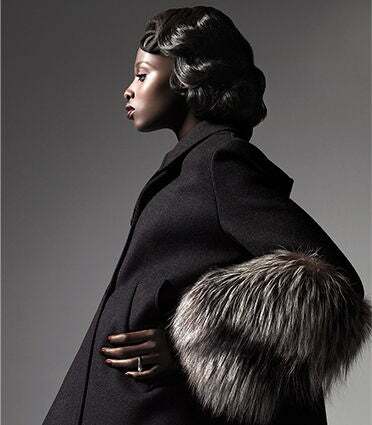 Dior by John Galliano trench with fur sleeves. Mikimoto pearl ring. DKNY tights. left) Dior by John Galliano dress. Jean Schlumberger for Tiffany & Co. earrings. Hue tights. Dior by John Galliano ankle-strap shoes. (right) Dior by John Galliano dress. Ellen Christine hat. DKNY tights. Dior by John Galliano satin pumps. Moschino gown. Hue tights. Manolo Blahnik shoes. Marc Jacobs sweater, shirt, trouser shorts and hat. DKNY tights. Gucci jeweled peep-toe pumps. Zandra Rhodes for Pologeorgis fur stole. J. Mendel dress and hat. Liz Palacios at Supplements New York earrings. Tiffany & Co. bracelet. Hue tights. Cesare Paciotti pumps. Valentino gown. Zandra Rhodes for Pologeorgis fur stole. Chopard necklace.